148Apps: "4/5 - Ski Solitaire has come along at the perfect time to reinvigorate the solitaire loving part of my mind." Enjoy Golf Solitaire or Tri Peaks Solitaire? 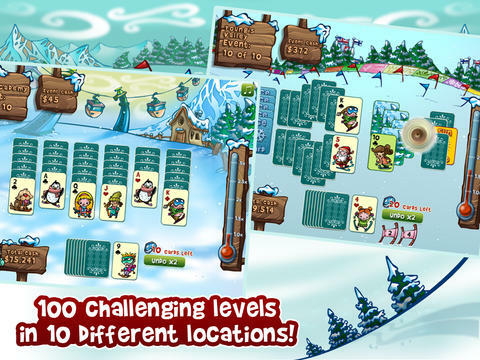 Then you'll love Ski Solitaire for the iPad, an exciting and addictive card game with course hazards, unpredictable weather, a ski shop, and a 100 handcrafted levels that will keep you playing for hours and hours. AppGemeinde.de: "5/6 - Ski Solitaire finally takes the classic card game in a new and refreshing direction." From forest covered valleys to the ice-capped mountains, players will have to use their wits to complete the course objectives. Clear the screen of cards to earn money whilst using the special gate cards to extend your streaks and reach the highest multipliers. Purchase powerups (such as ski goggles, gloves and even underpants!) in the Ski Shop using the in-game virtual currency to help you on the way to becoming the Ski Solitaire World Champion. • Game Center achievements and leaderboards - perfect for bragging rights!